SouthAsianPlaywrights.org is an on-line resource showcasing American and Canadian based playwrights of South Asian descent. 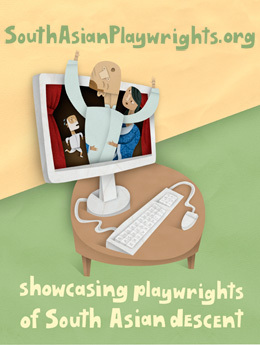 The goal is to create greater visibility for the participating playwrights and promote each playwright’s work to theatre companies, cultural organizations, and academic institutions, as well as to artistic directors, producers, directors, literary managers, editors, publishers, agents, and all other interested parties. The belief is that enhanced exposure will lead to an increase in the number of productions these talented playwrights receive. SouthAsianPlaywrights.org was created by Chicago’s Silk Road Rising in association with the South Asian Theatre Arts Movement (SATAM). The catalyst for the website can be traced to the first two National South Asian American Theatre Conferences - Desi Drama I (hosted by Silk Road Rising, Chicago, Illinois, July 19 – 22, 2007) and Desi Drama II (hosted by Pangea World Theater, Minneapolis, Minnesota, June 4 – 5, 2008). The initiative defines South Asians as persons with ancestry in Bangladesh, Bhutan, India, Nepal, Pakistan, and Sri Lanka, including persons of mixed ancestries.